No coincidence…US airstrikes against ISIS have fallen sharply to give Al Nusra (aka Al Qaeda) time to prepare for attacks on Syria (aka Assad). In other words, it looks like Obama is now opnely aiding Al Qaeda so it can regroup after devastating Russian airstrikes. The Islamic State used the lull in airstrikes in east Syria to move hundreds of fighters and heavy equipment towards the supply line that connects Damascus with the government held areas (green) of Aleppo. 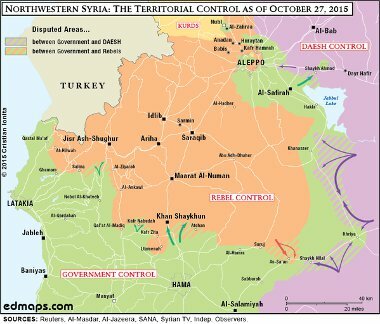 After two days of no U.S. airstrikes in east Syria the Islamic State (purple) attacked the government supply corridor from the east while at the same time and at the same main point Jabhat al-Nusra (orange) attacked the supply corridor from the west. The attacks started with suicide car bombs against Syrian army checkpoints which suddenly had to defend themselves to the front and the rear. For the first time in three months, the Syrian Arab Army’s (SAA) main supply route along the Khanasser Highway was closed due to an obstruction by the Islamic State of Iraq and Al-Sham (ISIS); this chaotic situation forced the pro-government forces to call on hundreds of reinforcements from the Aleppo Governorate to help push back the encroaching terrorists.Initially, the Syrian Armed Forces were successful in repelling both ISIS and the Syrian Al-Qaeda group “Jabhat Al-Nusra” after they attacked from different axes in the Hama Governorate; however, ISIS regrouped near the Al-Raqqa Governorate border in order to launch another massive assault on the Khanasser Highway. ISIS’ second assault on the Syrian Armed Forces’ defensive positions proved successful, as they cutoff the Khanasser Highway and pushed further west towards the strategic city of Ithriyah in east Hama. The Islamic State fighters killed about a dozen government troops and captured several armed vehicles (gruesome photos here). The Syrian army send reinforcements from the Palestinian resistance militia Liwaa Al-Quds to help clear the road. This was only somewhat successful as bad weather and a sandstrom on the 25th prevented air support. The operations room in Damascus was not too unhappy with the situation even though the road was still cut. The thought was that having IS and Nusra fighters concentrated in an otherwise wide open rural area would help to eliminate them. On the 26th and 27the Russian and Syrian air forces flew some 90 attacks within 24 hours against the enemy held parts of the road. These attacks cleared the IS held parts of the road but the Islamic State concentrated more forces on another part of the road further north and on October 27 it suicide-bombed another government checkpointand again blocked the road. Additional support from Hizbullah arrived during the next days and the road is now mostly cleared though still endangered. The closed supply route led to hardship for the nearly two million people in the government held parts of Aleppo as prices for produce and gasoline exploded. The operations room in Damascus where Syria, Iran, Russia and Hizbullah coordinate the intelligence and operations in Syria suspects that the attack on the supply corridor was coordinated at a higher level than just between Nusra and the Islamic State. The total cessation of U.S. air attacks on east Syria allowed the Islamic State to move hundreds of fighters and heavy equipment like tanks and cannons from its stronghold in Raqqa city to the west of Syria. At the same time Jabhat al-Nusra brought hundreds of fighters from other fronts south-eastward for its part of the attack. It is difficult to believe that these were just unrelated coincidences.